According to the U.S. Environmental Protection Agency (EPA), poor indoor air quality represents one of the top five leading health risks. Among the primary contaminants of indoor air are the paints, varnishes, and solvents we use that contain volatile organic compounds, or VOCs. VOCs typically are highest in oil-based paints and other finishes, but they are also present in most water-based, or "latex," paints. Exposure to VOCs in ​paint can trigger asthma attacks, eye irritation, respiratory problems, nausea, and dizziness, among other symptoms. Prolonged exposure has been linked to kidney and liver disease and even cancer. Given the health concerns of consumers and updated government regulations, alternative paints have been coming into the market in recent years, offering high-quality, reasonably priced formulas with relatively low levels of VOCs. However, not all low-VOC or no-VOC paints are equally healthy for your indoor air. Understanding some basics of VOC standards can help you choose a paint that meets your own safety requirements. The Green Seal organization sets much more stringent standards than the EPA for acceptable VOC levels in paint. For interior paint, the EPA allows levels of 250 grams per liter (g/L) for water-based paint and 380 g/L for oil-based paint, while Green Seal allows only 50 g/L for flat paint and 150 g/L for other types of paint. There is no clear mandatory standard for what constitutes a "low-VOC" or "low-odor" paint. Even the voluntary standards that do exist do not include the VOCs that may be present in the color pigment added to the paint at the paint store. And just like a lot of the"organic" marketing of our milk and foods, some companies use these terms loosely for marketing purpose. Furthermore, because these terms are confusing, a lot of store clerks may not know the actual VOC content of a paint. It is ultimately up to you to read the labels to see if paint at least meets or exceeds the Green Seal GS-11 Standard. Low-Odor and Low-VOC are terms used to describe VOC content that meets the less stringent EPA standard of 250 g/L for latex paints or 380 g/L for oil-based paint. But here's where it gets confusing. A paint may be labeled "Low-VOC" and be significantly better than these standards. For example, if you buy a Green Seal-certified paint, the maximum VOC content will be 50 g/L for flat paint or 150 g/L for other paint—not 250 g/L, as per the EPA standard. For truly low-VOC paint, you should look for a VOC range of 10 to 25 g/L. 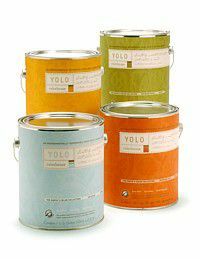 Zero-VOC or No-VOC paint is a misnomer, because these paints do contain very, very low levels of VOCs. Usually, paints marketed with these titles will have VOC levels under 5 g/L. Even when adding in color pigment at the paint store, which can add 2 to 5 g/L of VOCs, the total VOC content for the mixed paint should be under 10 g/L, which is excellent. This is as low as it gets for VOC content in paints offered by the larger paint companies. To get lower VOC content than this, you'll need to use more expensive and less readily available non-toxic or natural paint. Non-toxic and natural paints are primarily manufactured by alternative paint companies. These products can be harder to find than conventional paints, and you may have to order them online. They are made from natural ingredients, and although they are environmentally friendly and healthy, you may experience some performance difference in the way the paint covers (or doesn't) and flows off the brush. Just be aware that these paints don't all act like the mass-produced paints we're familiar with. The next generation in low-VOC paints has arrived with the advent of ceramic paint. It is not for use on ceramics, but rather it is a standard interior wall paint that uses microscopic ceramic beads as a key component of the paint film. The ceramic beads add durability and washability to the paint, making it more stain-resistant and longer-lasting than conventional paints. There are ceramic paints on the market with VOC levels as low as 20 g/L.